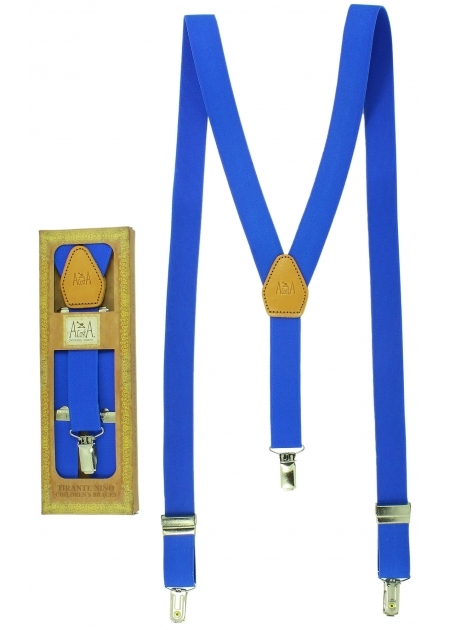 This premium quality girls' and boys' Royal blue braces/suspenders is hand made in Spain. The clips are firm and rigid, will not break easily, unlike most of the cheap braces on sale elsewhere. This braces is elasticated. It has two front clips and one rear clip. It is adjustable to suit a maximum height of 5 feet 4 inches/165cm (about 13 years old). The braces comes with a presentation box to allow it to be put back after use in order to help prevent the elastic from degrading over time.